Yesterday we mentioned that pod2g, one of the best hackers from the iPhone scene today, had returned to work to help you find Planetbeing another exploit for the jailbreak of iOS 6 . I say another because Planetbeing exploit already jailbreak iOS 6, but does not want to release because he wants always kept an exploit for hackers to jailbreak continue to next versions of iOS and further develop tweaks and modifications. Now Planetbeing pod2g and have found two new vulnerabilities in just one day, do not know what you will be able to do in a few weeks, what is certain is that it will bring an untethered jailbreak of iOS 6 for the iPhone 5 and new devices iOS 6. Two new vulnerabilities does not mean exactly two new jailbreaks, often requiring several security holes to create a jailbreak and make it public, as he points out in the post still lack some code to run. Now we just wait as we said yesterday, but it's likely that we all have iOS 6.1 jailbreak both crave, launch it now for iOS 6.0.1 and 6.0.2 would be a big mistake, Apple is about to launch iOS 6.1, close the hole and many are left without the option of jailbreaks. Throwing in iOS 6.1 We make sure that the jailbreak last longer. 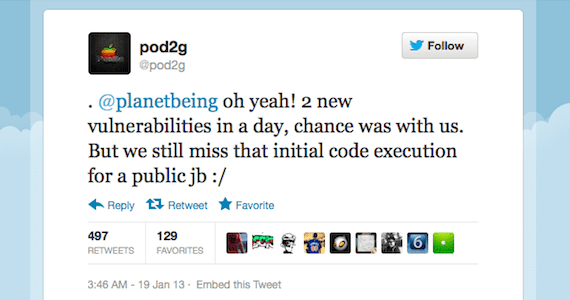 Article Planetbeing pod2g and found two new vulnerabilities for Jailbreak iOS 6 has been originally published in News iPhone .